Guess what? It's almost the weekend. I know, I'm ready for spring break, too. When I was little, I wasn't the writer of the family. The writer of the family was my cousin and (current) best friend, Emily. Emily was awesome; she was older than me, she wrote stories, and owned a typewriter, and was always up for an adventure, especially if it involved horses. So if you asked my grandparents when we were 10 year old, which one of us would spend our high school years persuading publishing and fiction writing, it would have been Emily. I wasn't scribbling stories at an early age. I didn't write stories until I was in middle school. But looking back, there are a few signs of my writer-ly-ness when I was little. In case you need to identify young writers near you, here are my early signs of a writer. I had a whole host of imaginary friends as a child. There was Kathy and Michel, and a whole bunch of others. We had adventures, and went to tea parties, we played dress up and bugged my older siblings to death. Looking back, these imaginary friends were just characters that lived in my head instead of my laptop. I had these imaginary friends when I was about 4 and they were the first signs that I'd become a writer. Before I could read well enough to read novels by myself, I started listening to audio books. I listened to them all the time. Even once I could read, I pretty much exclusively listened to audio books for a few years. Listening to the words read aloud really helped me grow a love for words. I think that these early audio books helped train my writing ear a lot. Audiobooks read books into my soul, and I soaked them up. Once I branched into reading actual books as opposed to audio books, I starting re-reading books. My family still thinks I'm crazy for reading books over and over again. And it's not even my absolute favorite books (those I read tens of times.) But even books that I sort of liked, I'll re-read. When I was in elementary school, I did this even more. Maybe I was just afraid of branching out to unknown sections of the library, but I read the same half dozen books four times apiece. I've recently seen that this thing for rereading books is common among my fellow writers. I think it's because we just love and 'get' the story and characters, and want to 'get' them even more. I always loved to read. I would have a book with me everywhere. But if left to my own devices, I read books in odd places. I read in trees and hammocks, on top of swing-sets and curled up in hot attics. Sometimes I hid form my homework in a closet (books and a flashlight always came with.) To me, reading wasn't boring, it was a romantic adventure to be embarked upon. And I loved starting my adventure in odd places. What about you? 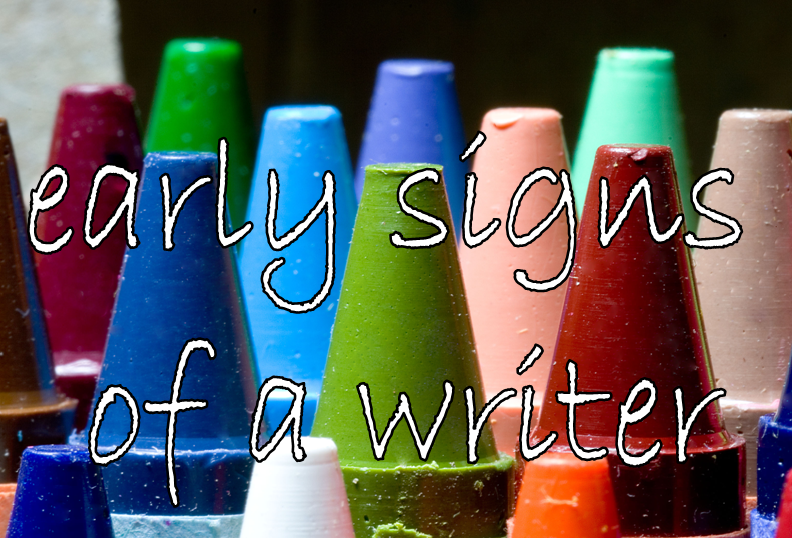 Where there any early signs you'd be a writer? Did you start drawing stories before you could write, or were you a little older when you found the writing life? Leave a comment and let me know. Audiobooks. Definitely. My mom raised me on them since day one. (Literally). I was quite fond of Dickens and Austen as a baby. Rereading? Not so much, but if there was a book I absolutely loved, I wasn't beyond reading it multiple times to make sure I didn't miss any of its awesomeness. And reading is always best up a tree. My mom agrees with me. Imaginary Friends? Tons. I could not begin to count all of the imaginary friends I have had over the years. Every new name I heard and liked became a new friend. Audio books not so much. In fact I believe I have ever actually owned/listened to one audio book in my life, The Wind in the Willows. But my Mum read books to us growing up like The little House on the Prairie series and The Old Squires Farm. I think this is where I get my writing style from. She must have read these books to us over a hundred time as we have grown up. Do I re-read books? Yes. Also, I usually end up reading books that I was board with the beginning. I'll put it down and wait for a time when my book shelf doesn't have a single book on it that I haven't read except that one and then I'll read it. I usually end up loving it too. Love reading in odd places,makes the book that much more romantic. I most certainly didn't have imaginary friends and because I was able to read at such a young age I never really listened to audio books (although now I listen to books in French to help me with that). I always re-read books and I love reading in weird places. Once I took a hike above a lake just so I could read over looking the lake :). I think some other sighs that I am a writer are 1) I have always loved learning and am very curious 2) Often I don't know I feel a certain way until I write it down (seriously there are times where I don't know I am upset until I sit down to write and anger pours from my fingers) 3) I love words and flowery sentences as long as they actually mean something. I used to make up scripts for my cowboys and Indians, and my Barbies. I wrote 3 books about the characters my Barbies played in a soap opera I made up, lol. Written by hand and bound by yarn. I still have them somewhere.